I love cats. I love every kind of cat. I just want to hug all of them, but I can’t. Can’t hug every cat. What I can do, though, is play games about cats. Thus, in this completely uncalled-for article inspired by a random IM conversation, I will list some of the cat-based games I have encountered so that other cat lovers may benefit from my feline gaming wisdom. A not-so-classic from the DOS days, Alley Cat saw you take control of a cat whose main goal was to jump into apartment windows and win mini-games until he finally got the chance to reunite with his love. 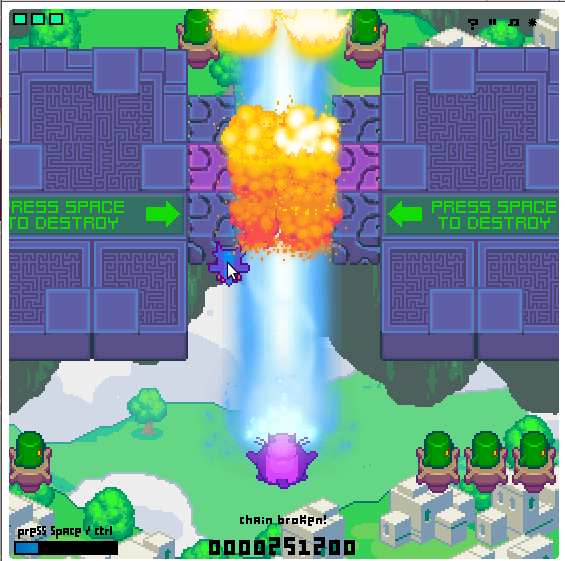 Naturally, all kinds of hazards awaited him, and death was a frequent companion in this game, which combined eye-bleeding colour choices and simplistic PC speaker sounds with feelings of tedium and impossibility. And yet, even after all these years, I can’t shake off a bizarre fascination with this game. Although one of the weaker games available on the fabulous Orisinal, Cats is still a fun diversion. The aim of the game is to have all the cats imitating the one in the shaded row by mousing over them to toggle between sitting and standing. Of course, cats being cats, they’ll only reluctant do what you want, sitting down just after you asked them to get up and vice versa. 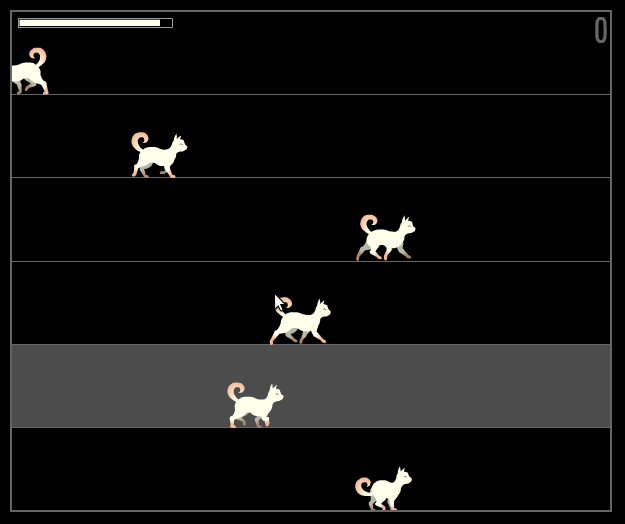 As the game progresses, more and more rows of cats are added, until it becomes impossible to keep them all doing what you want to. Cats is available to play here. The folks at Nitrome know how to make great games, and it seems that at least one person on their staff also really likes cats, because felines feature in quite a few of their titles. Fat Cat is an insane top-down shooter that re-imagines the tale of the owl and the pussycat as an alien-filled excursion to the fabled galactic picnic area. The invincible owl is the guardian of the pair, firing ammo to take out enemies, whilst the slower and more vulnerable cat must stay safe, eat cake and unleash a massive laser belch when required. 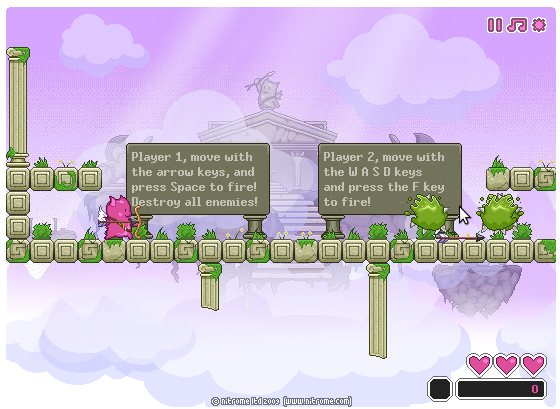 What makes the game so challenging is that the player has to control both characters simultaneously – the owl with the mouse, and the cat with the keyboard. It’s crazy, but it’s great fun, and every death just leaves you more determined to beat the game. Fat Cat is available to play here. Another game from the good people at Nitrome, Flash Cat sees the eponymous feline riding a giant caterpillar through a series of tricky and twisting courses, where one wrong move can send you plummeting into nothingness. Although no pushover, it’s probably one of Nitrome’s easier games. 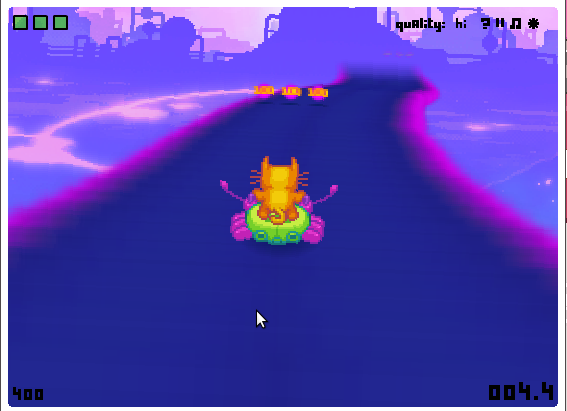 Flash Cat is available to play here. Instead of playing as a human, this Monster Hunter game sees you take on the role of an Airu (Felyne) and complete quests for the sake of an entire kitty village. Unfortunately, the game was never released outside of Japan, but true devotees can go the extra mile and import it. A game I reviewed some years ago, Purr Pals is just one of a slew of Nintendo DS titles about taking care of animals. Although ever so slightly entertaining to start with, like most entries in the genre, Purr Pals rapidly becomes tedious and repetitive, especially as the save data has a tendency to corrupt after a while, forcing you to start over. 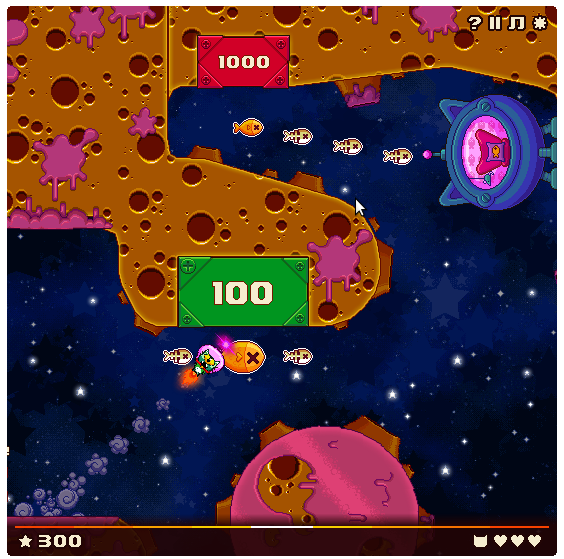 The third entry from the Nitrome stable, Rockitty sees you take control of a space kitty looking to get back to her cat cruiser. Set kitty off by clicking the mouse in the appropriate direction, and try to make sure she make a safe landing instead of veering off into the vastness of space. Like most Nitrome games, it’s easy enough to start with, but soon becomes challenging, requiring precise timing. Rockitty can be played here. 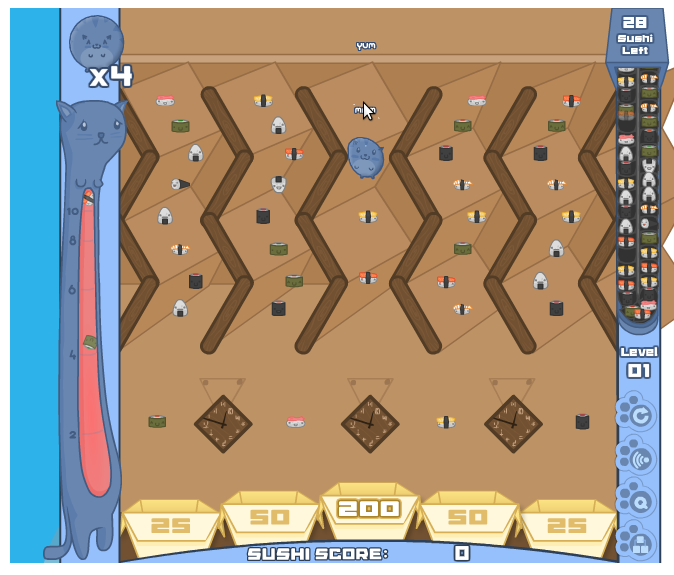 A series of five games, Sushi Cat is a Peggle clone with a slight twist – as Sushi Cat is dropped through the stage to collect sushi, he slowly gains weight, making him larger and squishier. Cute, well-made and even a little amusing, Sushi Cat won’t hold any particular challenge for Peggle aficionados, but it’s still an entertaining diversion. The Sushi Cat games can be played here. As a time-travelling cat at a busy intersection, your goal is to pick up treats whilst avoiding getting trampled by passers by. The “time travel” aspect basically means that the humans only move when you do, whilst everything stops when you stay still. Time 4 Cat can be played on various sites, including Facebook. Appropriately enough, we’re rounding off with yet another pair of games from Nitrome – Twin Shot and its sequel. 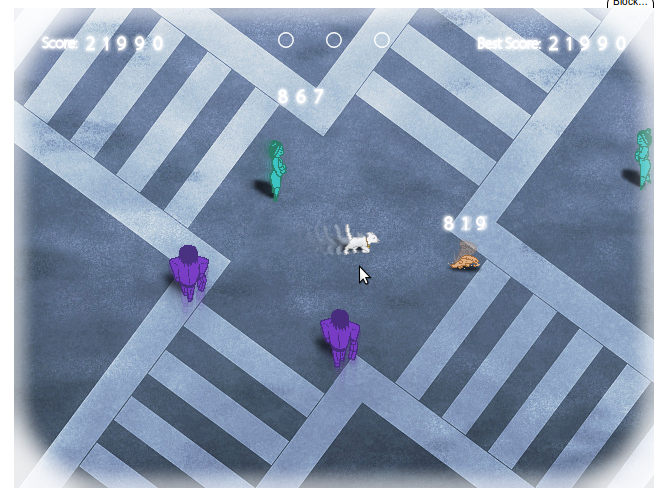 This game lets players take control of ultra-cute chibi angel cats and use them to shoot all manner of monsters. The sequel is more of the same, albeit with both “good” and “evil” level sets, and different skins for your cats. Twin Shot can be played here, with the sequel here. This entry was posted in Games and tagged cats. Bookmark the permalink.